A number of pedological soil classification systems have been developed worldwide. These include an internationally accepted system and various national systems, some of which have been incorporated into databases which include maps. Such information is used primarily for agricultural purposes. Various physical and chemical soil properties are used for classifying soils according to these pedological systems. This paper proposes an approach, based on a research project, which may be used to statistically significantly determine the plasticity characteristics of soils from the physical and chemical properties that are used to pedologically classify soils by systems, such as the South African Binomial System. These plasticity characteristics may be used to establish the engineering soil classification groups which may, in turn, be used as a means of rapidly determining the general suitability of areas for proposed developments, particularly during the preliminary stages of transportation route locations and township developments, with a resultant saving of time and money. Pedology is a branch of soil science which deals with the study of soils as natural phenomena, including their formation, morphological, physical, chemical, mineralogical and biological constitution. A number of pedological soil classification systems have been established worldwide and are used as a basis for mapping soils. Such systems include an internationally accepted system and many national systems. The internationally accepted system, which is endorsed by the International Union of Soil Sciences (IUSS), is the World Reference Base for Soil Classification (IUSS-WRB 1998, 2006 and 2007). This system replaced the Food and Agriculture Organisation (FAO) system, which was originally developed as a legend to the Soil Map of the World in 1974 (FAO 1974, 1990) (Rossiter 2012). National systems include the Australian (Isbell 1996), Canadian (SCWG 1998), English and Welsh (Avery 1980), French (Baize & Girard 1998, 2008), German (ABDBG 1998), Russian (Stolbovoi 2000), American (USDA 2010) and the South African Binomial Classification System (Mac Vicar et al 1977). These national systems are also utilised by private organisations. According to Rossiter (2001), soils that are allocated a particular national class should ideally all be allocated the same WRB system class. Published correlations of national classification systems to the WRB system include the South African Binomial System (Fey 2010) and the USDA system (Rossiter 2012). It appears that, in future, correlations will be established between other national pedological classification systems and the WRB system. The Canadian and Israeli classification systems have already been correlated to the FAO system, which was superseded by the WRB system (Rossiter 2012). Various international, regional and national databases comprising pedological, climatic, topographical and other information have been developed. International databases include the SOTER (Soil and Terrain) world database. This digital database, which includes maps and soil information (in a standard format), has already been compiled for a number of countries (Isric 2012). National databases include the following. The soil data included in the Land Type Survey of South Africa (LTSS 2012) include the pedological properties and pedological classification in accordance with the South African Binomial Classification System (after MacVicar et al 1977). From the above it is evident that a significant amount of pedological classification and mapping has been conducted worldwide. This data is used extensively and successfully primarily for the optimisation of the utilisation of agricultural land for crop production - so much so that pedology is often incorrectly regarded as part of agricultural science. It would be obviously beneficial if this data could benefit the engineering profession as well. This paper is based on a research project that was initiated by the premise that the physical and chemical properties of a soil, which are manifested in the pedological class of a soil, have a bearing on the engineering properties of that soil. In this research, relationships were established for determining the engineering plasticity characteristics, namely liquid limit (LL), plasticity index (PI) and linear shrinkage (LS) of soils deriving from a range of pedological classes of the South African Binomial System (after MacVicar et al 1977), from their physical and chemical properties which are determined for pedological classification purposes. These physico-chemical properties include the clay content, the percentage of the different exchangeable base cations and the cation exchange capacities (CEC), which are included in the data that is made available as part of the Land Type Survey of South Africa (LTSS 2012). The estimated properties may be used to assess the suitability of soils for proposed engineering projects. Such data could also be used to supplement other available materials data such as that included in the defunct National Data Bank for Roads (NDBR), which is discussed in TRH 2 (1978). The Binomial Classification System uses morphology (the science of form and structure) and composition of soils as criteria for differentiation in soil classification. It groups soils according to the similarity of the properties used in the identification. This comprehensive classification system employs two categories, namely an upper or general level consisting of soil forms, and a lower, more specific one, comprising soil series. The upper level consists of 41 soil forms, each defined by a unique vertical sequence of diagnostic horizons or materials, not more than four in number, occurring in the uppermost 1.2 m of the soil profile. Soil forms are based on selected soil properties used to define diagnostic horizons with fairly wide permissible variations and, therefore, each soil is classified further in order to narrow down such wide variations that might exist. Hence, each soil form is sub-divisible into a number of soil series, varying from one to 36. A total of 504 soil series constitute the lower category of the classification system. Soil series have in common the properties of the relevant form (that is, the prescribed horizon sequence), but are differentiated within the form according to a variety of criteria. 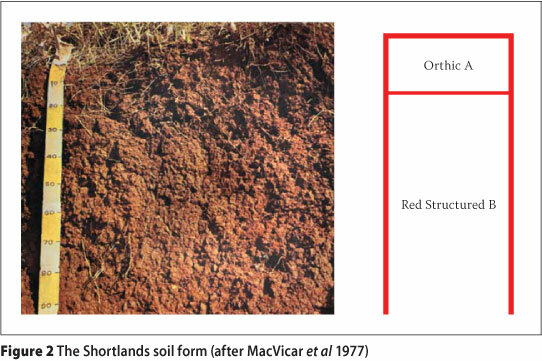 The criteria used for series differentiation within each soil form include the clay content, sand grade (where the clay content is less than 15%), red and non-red colouring, the presence or absence of free calcium carbonate, the degree of base status, which is a measure of the degree to which the soil has been leached, pH, and in some cases, the presence of continuous clay skins (or cutans) on ped faces, or a crusting distinct from a self-mulching surface. Identification and communication are achieved by means of standard designations, for example Hutton Mangano, where Hutton is the form and Mangano is the series (abbreviated as Hu 33). The soil series designation is retained regardless of where the soil occurs (MacVicar et al 1977). A revised version of the South African Binomial Classification System, referred to as the "Taxonomic System for South Africa", was published by the Soil Classification Working Group (SCWG) in 1991. This system is a more specific extension of the South African Binomial Classification System. Many persons have found the newer system to be "unnecessarily complicated" and hence have not adopted it (Rossiter 2012). Nevertheless, in this paper consideration is only given to the South African Binomial Classification System which has been solely adopted for soil classification in the Land Type Survey of South Africa (LTSS 2012), which was incorporated into the SOTER database, and which is still being used in South Africa. The area studied, which is located approximately 150 kilometres northwest of the city of Rustenburg in South Africa, is approximately 4 200 km2 in extent. The area was selected for its diversity of soil types. A number of soil types occur in the area, differing from one another as a result of different parent materials and/or the different soil-forming processes to which they had been subjected. The research was confined to the dominant soil series which adequately cover the range of soil types occurring in the area. Five soil forms were selected for the research. These are the Hutton, Shortlands, Valsrivier, Swartland and Arcadia forms, which are respectively shown in the typical photographs (with the associated horizon types) in Figures 1 to 5. Note that A horizons overlie B horizons (where present) which, in turn, overlie C horizons (where present). 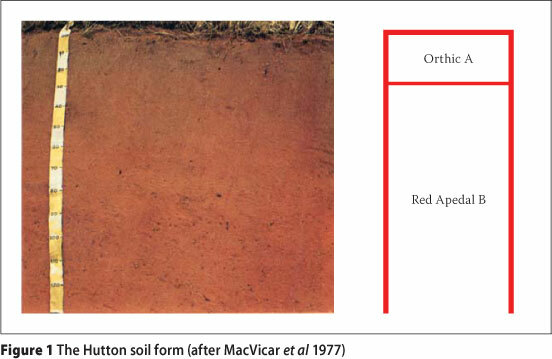 Therefore, for example, soils of the Hutton form comprise an Orthic A horizon overlying a Red Apedal B horizon. The correlations of the soil series selected with the World Reference Base (WRB) Classification System are included in Table 1. These correlations are in agreement with the general correlations established by Fey (2010). The soils at 63 randomly selected sites within the study area were classified according to the South African Binomial System (after Mac Vicar et al 1977). A total of 111 disturbed soil samples, taken from the A and B (where present) horizons of these soil profiles, were tested to determine the physical and chemical properties which are used as criteria for pedological classification. In view of the fact that the physical and chemical properties of C horizons are not reflected in the pedological classifications of profiles which contain C horizons, C horizons were not sampled. Details of the results, methods of analysis adopted, and references to the relevant methods, as well as brief discussions on the significance of each property determined, are given in the work of Fanourakis (1999). The number of series encountered in the study area, the number of soil profiles classified and the number of samples tested for the determination of their plasticity properties for the soils of each form are shown in Table 2. The plasticity characteristics of the 99 samples were determined in accordance with TMH1 (1986). It should be noted that all the possible soil series in the forms considered could not be included in this research as they do not occur in the study area. Generally, the plasticity index of a soil is approximately twice the magnitude of the linear shrinkage. For this reason, the possibility of excluding the linear shrinkage data from the analyses in this research was considered. 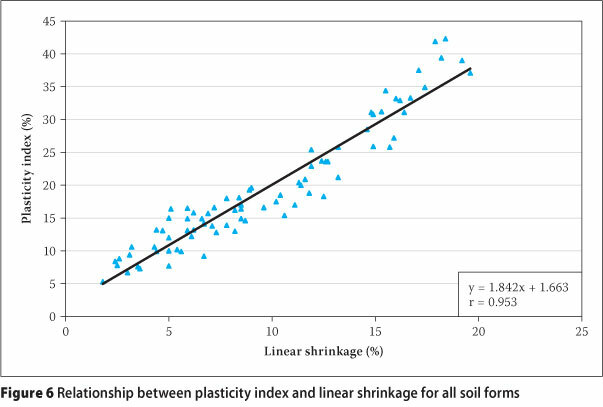 Figure 6 shows the relationship between plasticity index and linear shrinkage, for all the samples included in this research, which yielded a correlation coefficient of 0.953. With reference to the regression equation pertaining to the line in Figure 6, the plasticity index is, on average, approximately twice the linear shrinkage. 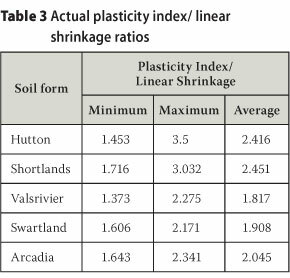 However, as indicated in Table 3, the actual (measured) plasticity index / linear shrinkage ratios for the soils of each form varied from 1.373 to 3.5. Hence, the actual linear shrinkage data was included in the relationships established. For each of the soil series included in the project, the liquid limits and plasticity indices of the samples taken from the diagnostic horizons (A and, where present, B) which displayed plasticity were plotted on a Casagrande plasticity chart (according to the USCS after USACE WES 1960). The plasticity data pertaining to those soil series which constitute each soil form were plotted on separate plasticity charts. The purpose was to investigate whether the soils of a particular soil series would yield points which are located within a particular zone of the plasticity chart. An examination of the five plasticity charts revealed that, in the case of the soil forms comprising B horizons, the points representing the B horizons were generally located to the right of the points representing the A horizons. This is because B horizons generally comprise a relatively higher clay content than the A horizons of their respective soil profiles. Furthermore, it is evident that the points representing soils of the same series were not located within a particular region of any of the charts. The reason for this is that series differentiation criteria are qualitative. Therefore, pedological information more specific than the soil series is required in order to determine the engineering properties of soils. The effect of quantitative chemical properties, such as the different exchangeable base cations (Ca, Mg, Na, K), S-value, base saturation, exchangeable sodium percentage (ESP), exchangeable magnesium percentage, exchangeable potassium percentage, and exchangeable calcium percentage on the plasticity characteristics of the soils constituting each soil form were evaluated with reference to liquid limit, plasticity index and linear shrinkage. The combined effect of each of the above-mentioned chemical characteristics, in conjunction with physical characteristics such as the clay content, silt content, and percentage finer than 0.075 mm on the plasticity characteristics of the respective samples, was also evaluated. In the evaluation of the above, the fact that the physico-chemical properties were determined using the fraction finer than 2.0 mm and the plasticity characteristics using the fraction finer than 0.425 mm was accounted for. A comprehensive list of the possible relationships between the plasticity characteristics and the various chemical and physico-chemical properties of the soils of each form investigated is given in the work of Fanourakis (1999). The magnesium in these soils was found to be the only factor that correlated with the plasticity characteristics. None of the data was transformed and no multiple regression procedures were adopted. The regression equations and correlation coefficients that were not significant at the 5% level were rejected. Lines were fitted to the data using the least squares method. Significance tests were carried out for each relationship established using tables of Student's t-distribution to determine the probability that the correlation coefficient could have arisen by chance in a sample of the size dealt with. Fisher's Z-transformation technique was used to combine independent correlation coefficients, which are significant at the 5% probability level, in order to obtain an estimate of the average (pooled) correlation coefficient. This procedure took into account each correlation coefficient and the corresponding number of sets of values on which it was based. In the case of the soils of each form studied, the magnitude of the liquid limit, plasticity index and linear shrinkage each correlated significantly, linearly and positively, with the amount of magnesium present in the clay-size portion of the fraction of the sample finer than 0.425 mm. This quantity which, in the succeeding discussion, will be referred to as magnesium in the clay-size fraction, is defined by Equation 1 and expressed in milli-equivalents per 100 g of soil finer than 0.425 mm. The quantity referred to in Equation 1 was defined specifically for the purpose of this discussion and should not be confused with either of the quantities termed "exchangeable magnesium" or "exchangeable magnesium percentage (EMgP)". The magnesium in the clay-size fraction was calculated by multiplying the value of the exchangeable magnesium (expressed in milli-equivalents per 100 g of soil finer than 2 mm, me %) by the ratio of the percentage by mass of the fraction of the total sample finer than 0.002 mm (P0.002 mm) to the percentage by mass of the fraction of the total sample finer than 0.425 mm (P0.425 mm). The definition of magnesium in the clay-size fraction (Equation 1) is based on two premises, firstly, that the exchangeable magnesium occurs almost exclusively in the fraction finer than 0.425 mm, and secondly that the exchangeable magnesium is distributed uniformly within this fraction. These premises were regarded as applicable to all the soils investigated in this project, regardless of the degree of base saturation. Firstly, that the magnesium cations are uniformly distributed within the soil fraction finer than 2 mm, and secondly, that the magnesium cations are uniformly distributed within the minus 0.075 mm fraction. The relationships established were not all significant and it can therefore be concluded that the upper size limit of the soil fraction in which the exchangeable magnesium predominates must be of the order of 0.425 mm. However, it must be emphasized that this is not because the engineering plasticity analyses are performed on the fraction finer than 0.425 mm of the soil. The exchangeable cations in a soil are adsorbed onto the negatively charged clay particles (Brady 1974). In view of this fact, the relationships established between the plasticity characteristics and the magnesium in the clay-size fraction indicated that the soils researched must contain clay particles which are larger than 0.002 mm in size. Furthermore, these relationships indicated that only the exchangeable magnesium which is adsorbed onto the clay particles that are finer than 0.002 mm in size had an effect on the plasticity. It is not unusual for soils to contain clay mineral particles which are larger than 0.002 mm in size. A study of the mineralogy of five weathering profiles developed from Archaean granite, conducted by Buhmann (1990), revealed that particles of clay minerals such as biotite occurred in the silt and sand size fractions of soils derived from Archaean granites. This was confirmed in a subsequent study of the compositional characteristics of the soils of 15 profiles developed from Archaean granite, which indicated that the proportions of certain weathering products of biotite (mica and mica/smectite interstratifications) were highest in the silt-sized fraction of the soil (Buhmann et al 1998). The biotites have a platy structure and high charges. Therefore, exchangeable cations are adsorbed onto the surfaces of these mineral particles, regardless of their size. The relatively large size of these clay particles is thought to be as a result of the slow cooling of the molten magma (Buhmann 1990). 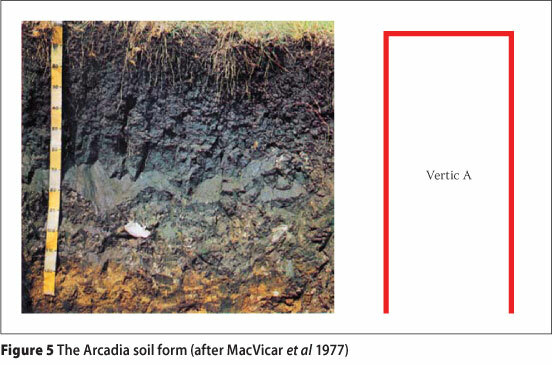 It is unlikely that the highly expansive soils of the Arcadia form derived from Archaean granite. In the study area these soils derived from the Bushveld Igneous Complex. Nevertheless, it has been shown that the swelling component of these soils can occur exclusively in the non-clay-sized fraction (Buhmann et al 1988). The correlations determined for the soils of each soil form are discussed in the succeeding paragraphs. The mean activity of the soils of the Hutton form was 0.47. Of the 48 soil samples of the Hutton form analysed, a total of 30 samples displayed plasticity. Examination of the grading and plasticity characteristics of these soils revealed that, on average, soils with a clay content of less than 12% did not display plasticity. This absence of plasticity is thought to be as a result of a low content of 1:1 clays in the soils. The relationships established between liquid limit, plasticity index and linear shrinkage respectively with the magnesium in the clay-size fraction are shown in Figures 7 to 9. The regression equations and correlation coefficients are included in these figures. The relationships established were all highly significant, being at the 0.001% level of probability. The correlation was positive -an increase in the magnesium in the clay-size fraction was associated with an increase in each of the three plasticity characteristics. A statistical analysis of the correlation coefficients of the relationships referred to above, and the three pairs of values from which each relationship was determined, yielded a pooled correlation coefficient of 0.863. The mean of the probability that these relationships could have arisen by chance was 0.0002%. The relationships established between liquid limit, plasticity index and linear shrinkage respectively with the magnesium in the clay-size fraction are shown in Figures 10 to 12. The regression equations and correlation coefficients are included in these figures. The relationships established were all highly significant, being at the 0.5% level of probability. The correlation was positive - an increase in the magnesium in the clay-size fraction was associated with an increase in each of the three plasticity characteristics. A statistical analysis of the correlation coefficients of the relationships referred to above, and the three pairs of values from which each relationship was determined, yielded a pooled correlation coefficient of 0.707. The mean of the probability that these relationships could have arisen by chance was 0.2%. The relationships between liquid limit, plasticity index and linear shrinkage respectively, and the magnesium in the clay-size fraction for the soils of these forms were analysed according to the six groups shown in Table 4, justified by the similarities described below. The red structured B horizon of the Shortlands form may resemble the red pedocutanic B horizons of the Valsrivier and Swartland forms in physical appearance. When classifying a soil pedologically, differentiation between red structured B horizons and red pedocutanic B horizons is determined by certain differences in the physical characteristics (including the structure and texture) of the B horizons compared to the corresponding physical characteristics of the A horizons in that soil profile. For example, if the textural class of a B horizon is different from that of the A horizon in the same soil profile, then the B horizon would be a pedocutanic B horizon. If, on the other hand, the textural class of the B horizon is the same as that of the A horizon in that profile, then the B horizon would be a red structured B horizon (MacVicar et al 1977). In addition, the Valsrivier and Swartland forms consist of an Orthic A horizon underlain by a Pedocutanic B horizon, and identical series differentiation criteria are applied for both. 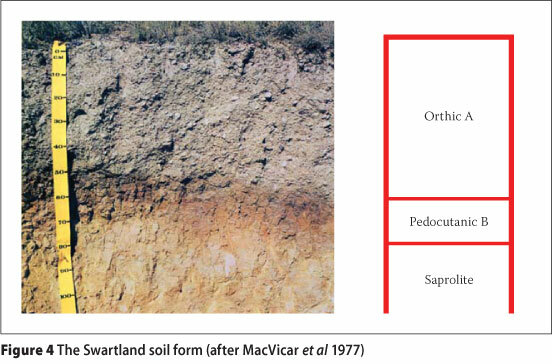 The only difference between the two soil forms is that Valsrivier and Swartland B horizons are underlain by unconsolidated material and saprolite, respectively. Therefore, the soils of these two forms were analysed as a single group. The pooled correlation coefficients, as well as the minimum, maximum and mean levels of significance for the six groups, are shown in Table 4. 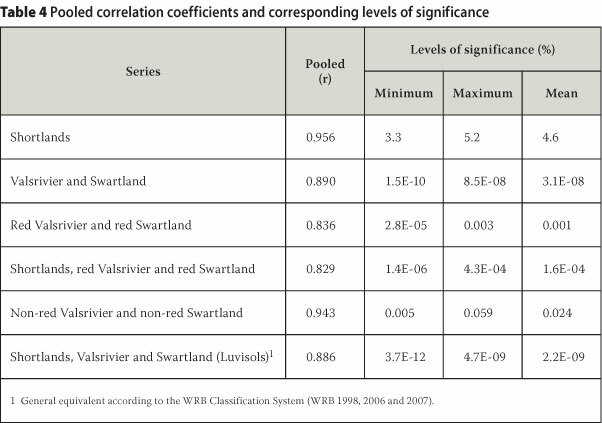 From the pooled correlation coefficients and mean probabilities shown in Table 4, it is evident that the best levels of significance were yielded when combining the data of the Shortlands, Valsrivier and Swartland forms. 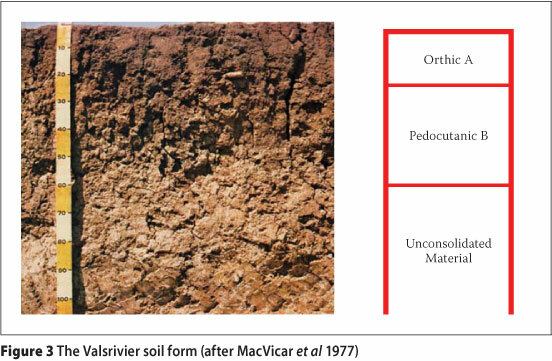 Therefore, the engineering plasticity characteristics of soils of the Shortlands, Valsrivier and Swartland forms can be determined from the magnesium in the clay-size fraction of each soil sample using the relationships established when the test results for the soils of all three of the above forms were grouped. Furthermore, in the case of these soils (which had a mean activity of 0.52) qualitative physical characteristics such as uniform colour, predominant colour and the presence of cutans did not bear any relationship to the soil's plasticity characteristics. This is true only for soils with physico-chemical properties within the ranges of the soils investigated, including a low exchangeable sodium percentage (ESP). The relationships established between liquid limit, plasticity index and linear shrinkage respectively with the magnesium in the clay-size fraction are shown in Figures 13 to 15. The regression equations and correlation coefficients are included in these figures. The relationships established were all highly significant, being at the 5E-09% level of probability. The correlation was positive -an increase in the magnesium in the clay-size fraction was associated with an increase in each of the three plasticity characteristics. A statistical analysis of the correlation coefficients of the relationships referred to above, and the three pairs of values from which each relationship was determined, yielded a pooled correlation coefficient of 0.886. The mean of the probability that these relationships could have arisen by chance was 2E-09%. This research showed that the liquid limit, plasticity index and linear shrinkage of soils can be statistically significantly estimated from the physico-chemical data of soils, for a range of pedological groups. All the relationships established for estimating the plasticity characteristics of the soils of the Hutton form (Ferralsols and Arenosols according to the WRB Soil Classification System), Arcadia form (Vertisols according to the WRB system) and Shortlands, Valsrivier and Swartland forms (Luvisols according to the WRB system) were highly significant (P < 1%). With the aid of quantitative pedological data, the plasticity characteristics of soils, which are used to classify a soil for various intended engineering purposes, can be estimated with significant accuracy. Hence, this information may assist in the identification and avoidance of large areas of unfavourable soils in projects such as township development and transportation route alignment, resulting in a saving of time and money. Conversely, areas or routes covered by favourable soils can be located, hence providing the framework for more detailed testing required for the final engineering design. The findings of this research are valid for soils of the pedological classifications investigated and their particular physical, chemical and mineralogical properties only, since the research project was intended to serve as a pilot study. The indications are that additional similar studies covering soils of the pedological classifications researched, but with different chemical properties, as well as soils with other pedological classifications with varying chemical properties, could undoubtedly lead to the extension of this work and improvement of its universality. It is recommended that, in future research, the data of soils of forms of the same WRB class be grouped for relationship establishment purposes, as was done in the case of the Luvisolic soils in this research. This would obviate the application of incorrect regression equations as a consequence of incorrect pedological classification of similar soils. Finally, it is hoped that this research has succeeded in emphasising the interrelationships between pedogenesis and the engineering behaviour of soils, and in suggesting an approach for the interpretation of pedological data for engineering purposes. The author thanks the Agricultural Research Council (ARC) for permitting the inclusion of the photographs of the soil forms in Figures 1-5. PROF GEORGE FANOURAKIS is an Associate Professor in the Department of Civil Engineering Technology at the University of Johannesburg, South Africa. He received the degrees MSc (Eng) from the University of the Witwatersrand anc DTech (Eng) from the University of Johannesburg. He is a Chartered Civil Engineer and Member ofthe Institution of Civil Engineers (UK), and a Fellow of the South African Institution of Civil Engineering (SAICE). His primary teaching and research interest areas are concrete technology ane geotechnical engineering. Prof Fanourakis heads the Materials, Geotechnica and Transportation Engineering Research Group at the university. He is a member of the South African Bureau of Standards Geotechnical Standards Committee (SABS SC 59P). In 2006 he received the SAICE award for best paper published in the Journal of the South Afrcan Institution ofCivil Engneering.